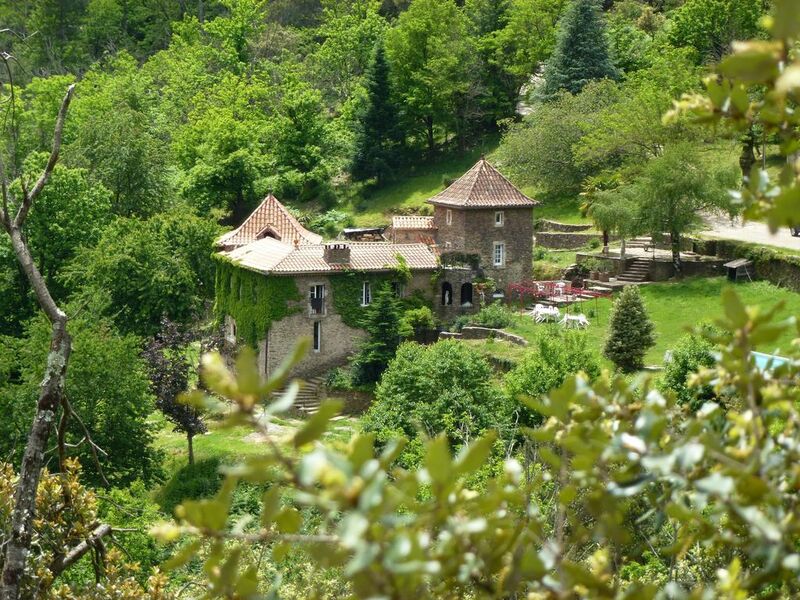 L'Elzet Gites, a unique château-style country home nestled in the foothills of the Cevennes National Park by the Stevenson Trail and overlooking fantastic panoramic views of the valley below and beyond. Great village amenities and bar-restaurant, just 1km walk or 1.5km drive. The nearby gorgeous crystal clear aquamarine spring-water river swimming, with beaches, cascade, rock-pooling, paddling, and even a bar-cafe-restaurant at the beginning of river walk, where you park your car make this an idyllic holiday! Sleeps up to 6 people: Large living/dining area and a well equipped kitchen. Master bedroom has a large double bed and the second bedroom has twin beds. Shower room and toilet.There is a large balcony with stunning views across the valley. SHARED OUTDOOR AREAS: Large garden with shaded banquet area, tables and chairs and BBQ, sun beds, shared swimming pool all with beautiful panoramic views over the valley and beyond. Parkland and woodland trails. A lovely tranquil, relaxing and evocative setting. SHARED INDOOR AREAS: Large living/dining area with a beautiful view across the valley + lounge with house television and sofas. A "PARADISE" WHERE YOU CAN REST: L'Elzet is also an ideal retreat outside of school holidays for those who want tranquility and lifting of their spirits, or to recuperate. It is infinitely inspiring for artists, photographers, and walkers, and the famous Stevenson Trail (Robert Louis Stevenson 'Travels with a donkey in the Cevennes') passes through the valley here. Many of our visitors have called it a paradise. We have countless great reviews and many visitors come back year after year! Every season has its beauty in this idyllic location near St Jean du Gard and the magnificent Cevennes National Park. There is so much to do locally, for families and couples alike. SAINT-ETIENNE-VALLEE-FRANCAISE: Our village is a typical Cevenol community where you can experience authentic friendly french life, and is just a 1km walk or 1.5km drive. We have a Mairie where local events often take place, well stocked mini Spar supermarket, specialist bakery-patisserie, butcher, takeaway, bar restaurant(s), tennis, football, horse and donkey riding; and local school. The crystal clear river swimming is either by our village or 3.4km from here. There are lots of clean often white beaches, with paddling, and rock-pooling, all in a wonderful oasis, both with bar-restaurant close by. SURROUNDINGS: There are great local markets such as nearby St Jean Du Gard Tuesdays and Saturdays, and Thursdays at historic Anduze, which sell not just traditional local cullinary products but a wealth of colourful artisan made products and wares to tempt you. This area is a jewel in the diverse region of Languedoc in the South of France. Visit Spring and Autumn- each and every season offers a very different holiday experience and you are more inclined to be adventurous when it is less hot. Just in case - all gites have heating. Two of our gîtes have a cosy log burner. Being located in the South East of the Cevennes, on the border of both Lozere and Gard means we are ideally placed for not just the National Park, but also Nimes and the nature reserve of the Camargue, or south to Montpellier and the sea, west to Uzes, the roman Pont du Gard and even visit Avignon just over the river in Provence. There are too many adventure activities in the Cevennes to mention - walking trails, hiking, mountain biking, mountaineering, canoeing. rafting, water tubing, tree assault courses, and exciting caving to name a few. THE CEVENNES NATIONAL PARK : The Cevennes is a UNESCO protected Biosphere and World Heritage Site. The rugged beauty and diversity of granite meeting limestone means sheer ridges, deep gorges gouged out by crystal clear rivers, and dramatic limestone caves to thrill. The scenery is breathtakingly spectacular. There are more than 2400 animal species and unique flora from Mediterranean through to alpine species. You will find a classic way of life here, with its mix of mountain, valley pastures, farmlands and many ancient villages and the total of all of this, and its culture, is protected by the UNESCO Biosphere and now a WORLD HERITAGE SITE. The border of the park has been extended to include Saint Etienne Vallee Francaise which is also in an area of outstanding natural beauty, and is part of the Stevenson trail (GR70) and many other beautiful walks. Robert Louis Stevenson wrote the book 'Travels with a Donkey in the Cevennes'. The Wines of the Cevennes & Languedoc: The Languedoc vineyards of the Southern Cevennes produce some of the best wines in Languedoc including organic wines. Jeaves Ropero is half French, half English, and grew up in York, UK. She moved to France in 1986 to build l'Elzet with her then husband. For many years Jeaves has built a solid reputation for providing excellent hospitality (and for her meals !) L'Elzet has visitor books with countless testimonials, and many many have said they arrive as visitors, depart as friends! Some visitors return year after year, sometimes twice in the same year, to experience the changing beauty of the seasons, friendship, and a home from home. Jeaves and her then husband used to stay in the local village of St Etienne Vallee Francaise every year from around the beginning of the 1980's. They had fallen in love with the dramatic beauty and diversity of the magnificent Cevennes and its National Park yet have easy access to and from several airports (Nimes less than 1hr drive), the Camargue and the Mediterranean coast. They never tired of it. This is now a unique chateau style property like no other and she began renting out her first gite - the Tower Annexe and has since added the characterful Clede converted chestnut drier cottage, and a super 2 bedroom apartment, with stunning views overlooking the valley below, (on the same level as the garden and swimming pool). There were so many reasons they chose the site - the evocative atmosphere, the many vistas along its extensive woodlands, next to a friendly local village community and its many amenities, not forgetting the central bar-restaurant to mingle with the locals, tennis courts and horse riding, oh, and the fabulous crystal clear river swimming and cascade nearby, the famous Cevennes National Park, - and more. Having owner hospitality makes every difference to a holiday experience, and Jeaves is a fantastic host and a great cook ! You can be self-catering, or have meals. Out of the main season it is possible to stay for B&B, short breaks, or long let. Visitor feedback suggests you will fall in love with L'Elzet. It is a home from home whilst also having a unique character and evocative atmosphere. The many vistas along its extensive woodlands, next to a friendly local village community and its many amenities, not forgetting the central bar-restaurant to mingle with the locals; tennis courts and horse riding; oh, and the fabulous crystal clear river swimming and cascade nearby, so pure you might not want to swim in the sea again - all combine to make a holiday here special. Everyone should experience the wonders of the Cevennes National Park! There is a log burner in the living area and also, a very grand fireplace in the main house. There are tennis courts just down the road this side of the village. Please bring your own rackets. Tranquil location. Fabulous crystal clear river swimming just 3.5km, Cevennes National Park, walking, canoeing, caves, steam train, many activities. Museums, markets at St Jean du Gard and Anduze. The magnificent Cevennes National Park is stunning ( a UNESCO World Heritage site) in Languedoc Roussillon, We are by the border of both Lozere & Gard. You can just drink in the stunning panoramic views, and enjoy the many different vistas along 5 hectares of our woodlands or you can have lazy days with perhaps a walk to the nearby village, interacting with the friendly community and sit outside the shaded bar-restaurant we have here, this may be enough for you. But fabulous aquamarine crystal clear river swimming is 3.5km from L'Elzet is an idyllic oasis and has paddling, rock-pooling and beaches. The Stevenson Trail (GR70) passes through here and the village (1-1.5km). Here you have tennis courts, horse riding, football, weekly events during the summer, bar/restaurant(s), small 'Spar' supermarket, butcher, bakery-patisserie, school and doctor. St Jean du Gard 13km colourful markets. Cevenol Museum, Steam Train, Bambouzerie Park, historic Anduze, Activity centre Parc Parfum D'Aventure, Caves de Trabuc, vineyards; cosmopolitan Ales; historic Uzes, Pont du Gard, Avignon, Nimes, Montpellier, Mediterranean coast. Visitors fall in love with L'Elzet & this magical region and so will you!